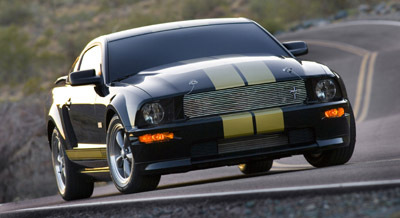 The 2006 Mustang is very much like the all new Ford Mustang for 2005 which is actually a good thing. Ford's new Mustang Pony Package offers V6 owners a chance to experience the better suspension upgrades available to GT owners. The improvements include a beefier front sway bar and the addition of a rear sway bar in addition to the standard panhard rod setup. Like the classic mustangs of the 60's the pony package will include a revised grille with round fog lights, and a special identifying interior treatment. And of course a special lower pony stripe will identify it to the motoring public. The Mustang GT-H (short for GT Hertz), not seen since the 1960's returns to Hertz, with a special edition black with gold stripes paint job. Like the original, its a limited production (500 units) program available for rent at a few major Hertz outlets. The Ford Racing engineers bumped up the output by 25 horsepower to 325 with their Power pack and revised exhaust, cold air induction and an X pipe coupled to a revised cat-back exhaust system. Who says traditional performance parts don't work? The exterior is available in nine colors with impressive names such as Screaming Yellow and Legend lime. Gotta keep those copywriters busy. Only slight differences in the 2006 Mustang GT are apparent, with the most obvious being the addition of some meatier and wider 18" wheels and tires to get all that horsepower to the ground. The new Mustang Pony Interior includes, a more GT like interior with satin or dark aluminum looking accents at the steering wheel, shifter and front dash facia. The GT interior remained relatively unchanged. The base 4.0 liter V6 continues with 210 horsepower, while the Gt retains the 300 horsepower 4.6 liter V8 from the 2005 car. The Mustang GT-H with its hot rod upgrades jumps to 325 horsepower with its 4.6 liter V8 and is coupled to a 3.55:1 rear axle ratio for extra grunt. Suspension mods include lowering springs,upgraded sway bars and re-valved shocks and a not quite Monte Carlo style shock tower brace. Check out this link for more pictures and specs on one of the best used car bargains on the market, the 2006 Ford Mustang GT. Return from 2006 Mustang to 2005-2010 listings.